you charm the pants right off me, it's like I am talking to an innocent 8 year old half the time, Prerak soni 1/4 of the time, and the rest is some mix to be determined by blood work" Needed to save this somewhere. Why not here. A team led by a professor at the University of California, Riverside Bourns College of Engineering has made a discovery in semiconductor nanowire laser technology that could potentially do everything from kill viruses to increase storage capacity of DVDs. Ultraviolet semiconductor diode lasers are widely used in data processing, information storage and biology. Their applications have been limited, however, by size, cost and power. The current generation of ultraviolet lasers is based on a material called gallium nitride, but Jianlin Liu, a professor of electrical engineering, and colleagues have made a breakthrough in zinc oxide nanowire waveguide lasers, which can offer smaller sizes, lower costs, higher powers and shorter wavelengths. Until now, zinc oxide nanowires couldn't be used in real world light emission applications because of the lack of p-type, or positive type, material needed by all semiconductors. Liu solved that problem by doping the zinc oxide nanowires with antimony, a metalloid element, to create the p-type material. The p-type zinc oxide nanowires were connected with n-type, or negative type, zinc oxide material to form a device called p-n junction diode. Powered by a battery, highly directional laser light emits only from the ends of the nanowires. "People in the zinc oxide research community throughout the world have been trying hard to achieve this for the past decade," Liu said. "This discovery is likely to stimulate the whole field to push the technology further". Liu's findings have been reported in the recent issue of Nature Nanotechnology Co-authors are: Sheng Chu, Guoping Wang, Jieying Kong, Lin Li and Jingjian Ren, all graduate students at UC Riverside; Weihang Zhou, a student at Fudan University in China; Leonid Chernyak, a professor of physics at the University of Central Florida; Yuqing Lin, a graduate student at the University of Central Florida; and Jianze Zhao, a visiting student from Dalian University of Technology in China. The discovery could have a wide-range of impacts. For information storage, the zinc oxide nanowire lasers could be used to read and process much denser data on storage media such as DVDs because the ultraviolet has shorter wavelength than other lights, such as red. For example, a DVD that would store two hours of music could store four or six hours using the new type of laser. 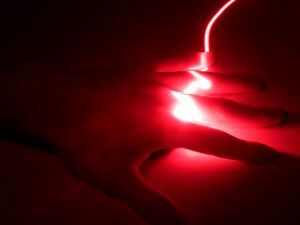 For biology and medical therapeutics, the ultra-small laser light beam from a nanowire laser can penetrate a living cell, or excite or change its function from a bad cell to a good cell. The light could also be used to purify drinking water. For photonics, the ultraviolet light could provide superfast data processing and transmission. Reliable small ultraviolet semiconductor diode lasers may help develop ultraviolet wireless communication technology, which is potentially better than state-of-the-art infrared communication technologies used in various electronic information systems. While Liu and the students in his laboratory have demonstrated the p-type doping of zinc oxide and electrically powered nanowire waveguide lasing in the ultraviolet range, he said more work still needs to be done with the stability and reliability of the p-type material. Prerak soni. Awesome Inc. theme. Theme images by fpm. Powered by Blogger.